While the summer is a great time for college students to make extra money, many seek out summer jobs that pay minimum wage. There’s nothing inherently wrong with this. It’s far better to work and earn money than spend all summer at the pool. However, the best summer jobs for college students allow them to make well above minimum wage. For example, when I started college I worked in a special collections library, which paid $5.50 an hour. However, I started tutoring kids in math on the weekends, earning $20-$30 per hour. I also worked in a scrapbook store for $8 per hour, but taught ballet to young kids for $15 per hour. The higher paying jobs allowed me to travel and have great experiences like going to a national championship football game. I’ve always loved earning and having my own money, and I loved earning a lot per hour in college. I like to encourage students to seek out good summer jobs for college students that pay more than minimum wage. Just because you’re young and in college doesn’t mean you can’t make a great income! College is a great time to flex your entrepreneurship muscles. This summer, you can start a blog, begin a dog walking service, or start selling things on Amazon or eBay for profit. It’s also a great time to shop garage sales to find items to flip. You can tutor younger kids, teach them how to code, or learn how to code yourself while you have time off so you can start side hustling when you head back to school. You can make thousands of dollars starting your own business. That’s far better than making $8 per hour flipping hamburgers! If your car meets the requirements, which you can check out in this post, you can drive for Lyft. The great thing about this service is you can set your own hours. If your parents help you pay for your car insurance, check that you have the proper levels of insurance to drive passengers. Lyft also offers bonuses during certain hours. If you feel comfortable, you can often make extra money driving late at night too. While all your friends are staying up late partying in the summer, you can make great money transporting them to and from parties. If you want to start driving for Lyft, they offer a $250 bonus to new drivers to help you start earning. Becoming an au pair is one of the best summer jobs for college students. This job typically involves being hired by a family to live with them for the summer and take care of their children. Most of the time, you’ll be traveling to a foreign country. For example, you could be an au pair for the summer in Italy or France. Many foreign parents want their children to become proficient in English and hiring an American au pair is a great way to achieve that. Au pairs don’t get paid a lot. But all of your expenses are covered including plane flights, food, and lodging, so you can actually save most of the money you make and have a great experience in a different country while you do it. Did you know that Uber has a service called UberEats? Essentially, people place food orders online and you pick up and deliver it. This includes restaurants like McDonald’s where you can literally go through the drive-thru for someone. If you’re a college student, this is a way to work for Uber without having people in your car. You can just make deliveries for people and bring the food to their door. Don’t have a car but still want to give UberEats a try? You can also work for them with a scooter, motorcycle, or bike. Driving for UberEats is one of the best ways to get paid for driving your car, not to mention one of the highest paying summer jobs for college students that lets you set your own schedule and make good money. If you type fast or if you have a great eye for grammar and typos, becoming a proofreader or transcriber is one of the best summer jobs for college students. Transcribers do things like listen to podcasts or audio files from people who want them to transcribe emails or even books on their behalf. Proofread Anywhere provides free courses to help you learn how to land proofreading and transcript proofreading jobs. These jobs can pay well above minimum wage, sometimes as much as $39 per hour. Like many of the jobs on this list, you can do this on your own time and from anywhere. All you need is a laptop and the time to do the work. As a college student, you have many skills that are useful to business owners. You probably are savvy with social media, know how to respond to emails, and can complete many basic tasks online. Because of that, you can make great money as a virtual assistant. In order to become a virtual assistant, start by making a list of the skills you already know how to do or are willing to learn. Then take those skills and start offering them to business owners. My friend Kayla earns over $10,000 per month as a virtual assistant. If you want to start your own freelance virtual assistant business, sign up for her course to learn how. Becoming a house sitter is a great way to stack earnings on top of your typical summer day job. It won’t replace a job in the summer, but it’s a great way to earn extra money during the summer for students that requires minimal work. Being a house sitter allows you to earn at least $25 to $30 per day. In most cases, you simply need to sleep at the house and make sure everything runs smoothly. You can add this to a normal day job to increase your summer earnings. Referrals typically drive clients to working with a particular house sitter. You can set up a profile on Housesitter.com to get reviews or find gigs. This allows prospective clients to view your recommendations and for you to get new business. Working during the summer is often necessary for most college students. There are many opportunities to make money but not all jobs are equal. Many allow you to earn a decent income, but there are also opportunities to earn more and build a solid skill set. These are the jobs that will help you earn more now and in the future. Ultimately, if you’re a college student, try some of the jobs listed above this summer. You don’t have to seek out a minimum wage jobs. The best summer jobs for college students will pay you well above that. Plus, with many of them, you can learn valuable life skills along the way. What was your highest paying summer job as a college student? What are some other good summer jobs for college students? Did you have a favorite job in college? 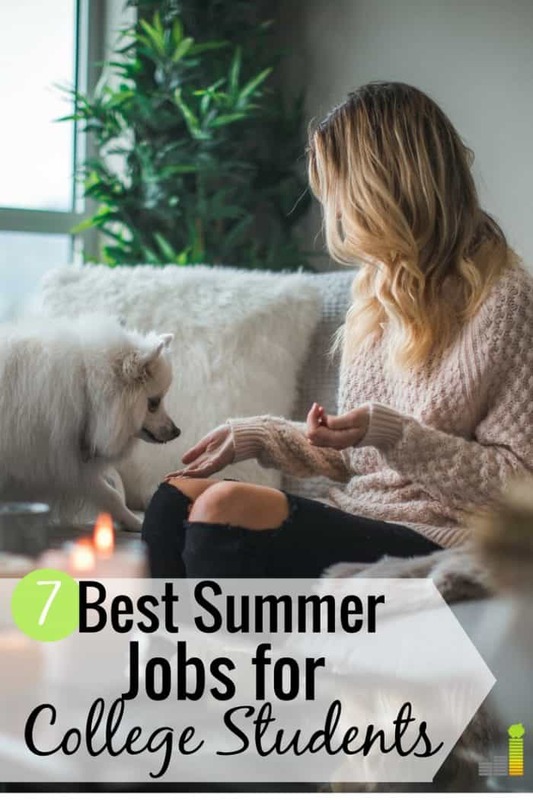 The post The 7 Best Summer Jobs for College Students appeared first on Frugal Rules.